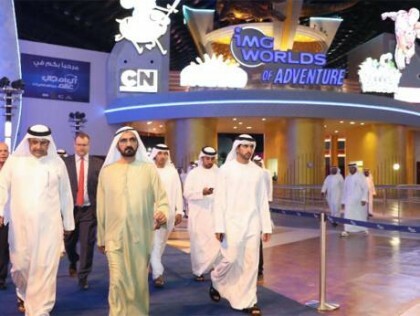 Dubai ruler Sheikh Mohammed bin Rashid Al-Maktoum on Wednesday opened IMG Worlds of Adventure, the world’s biggest family and leisure indoor park, in Dubai, the United Arab Emirates (UAE). With a size of 1.5 million square feet, the park can host up to 12,000 visitors per day. Sheikh Mohammed toured the park together with Shaikh Hamdan Bin Mohammad Bin Rashid Al Maktoum, Dubai Crown Prince, and Shaikh Maktoum Bin Mohammad Bin Rashid Al Maktoum, Deputy Ruler of Dubai. “The size of the multi-billion dollars park equals 28 football fields,” the park’s CEO Lennard Otto told Xinhua. The park took around 36 months to complete and was originally scheduled to receive tourists by the end of 2014. It was funded with $51.71 billion U.S. dollars and private equity provided by Ilyas and Mustafa Galadari Group. Shaikh Mohammad pointed out the massive development witnessed by the tourism, entertainment and hospitality sectors. He said that these sectors are key economic foundations that support UAE Vision 2021 and National Agenda, which aim to make the UAE the region’s capital for economy, tourism and trade. Shaikh Mohammad praised the clear and positive contributions of national investments in supporting the UAE’s approach for continuous economic development.